Long title, slighly longer explanation. According to the Windows Mobility Center – Extensibility document, Display Brigthness tile is displayed only when the hardware & driver conditions are met. Shows the current brightness setting. The slider enables the user to modify the LCD screen brightness. The user clicks the icon to open the Personalization CPL. BIOS Communication for Display Drivers in Windows Vista (http://go.microsoft.com/fwlink/?LinkId=50987) for more information. 2. Work with your video independent hardware vendor (IHV) to provide brightness support in their video miniport driver. According to Intel, the 910/915 family will only have Windows XP Driver Model (XPDM) drivers instead of Windows Vista Driver Model (WDDM), which may be in fact the cause of this issue. There was quite a heated discussion on Josh Bancroft's (Intel) blog a while ago and I see there's an online petition to Intel for the WDDM drivers. I'm afraid I don't know of any solution for this, you could try updating your graphic card driver form the chip manufacturer, rather than from Toshiba. 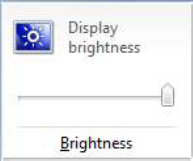 Some laptops work with FN+Up/Down arrows to control brightness.